What do you think of videographics? You know…take the idea of an infographic but create it in video. 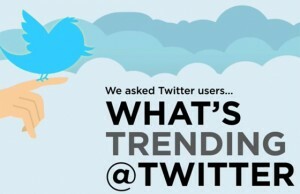 This one provides stats on Twitter users – what they tweet, when and why. The video is well done. I like the incorporation of birds tweeting in the audio for added effect. However, videographics aren’t a new phenomenon. These types of videos are shown at conferences all the time, then circulated via social media. Here’s one describing how the Internet / Information Age is shifting how people connect/work/live and what it means for the future. A videographic certainly makes it easier to digest the stats versus scanning the fine print of a large infographic. Watch these videos then tell me what you think. Should infographics be replaced by videographics?